Review of St. Peter’s Old Style Porter | Beer Apprentice - Craft Beer News, Reviews, Interviews and Info. Hello everyone. For today’s craft beer review I’m going to be sampling the St. Peter’s Old Style Porter brewed by the St. Peter’s Brewery Co. Ltd. situated in St. Peter South Elmham, Bungay, Suffolk, United Kingdom. Thus far in my craft beer journey I’ve had some mixed experiences with brews from St. Peter’s. However, I really enjoy Porters, so I’m hoping for the best with this one. The website, stpetersbrewery.co.uk, revealed this bit of knowledge for us. Ok. How ’bout it? Ready for a sip? This brew came in a 16.9 oz. bottle and it had an ABV of 5.1%. It poured a very, very deep ruby red to brown color. Some brighter ruby hues shown through when held toward a light source. The crown had a light tan tint to it. It was quite creamy, smooth and sized well. The retention time was ok and the lacing was solid enough. The nose smelled very “creamy”. Almost like a butter tone. Hints of chocolate trailed while touches of toffee sweetness and toasted grains followed. The balance and harmonization were nice, however it wasn’t extremely boisterous or potent. The taste had a buttery, creamy relish also. Hints of earth as well. It had an aspect similar to an extremely robust herbal tea. Interesting. More of the toasted grains and minute toffee intermingled with a subtle chocolate to finish it off. The mouthfeel was medium bodied. Very smooth, slick and mostly dry. The carbonation leaned toward the medium/low side, while a decent shot of flavor was left behind for me to enjoy between sips. Well, this beer wasn’t bad. I must admit though that I don’t have much experience with “old style Porters”, so I don’t really have a base to compare this beer to. It’s definitely a bit different from the Americanized Porters that’s for sure. It wasn’t near as roasted or as “hefty” as some of those. Either way it was still a decent beer and very easy to drink. I’d drink it again no doubt. You guys should pick it up if you see it. I’ll probably try to seek out a few more of this type so I can get a better grasp of the style. 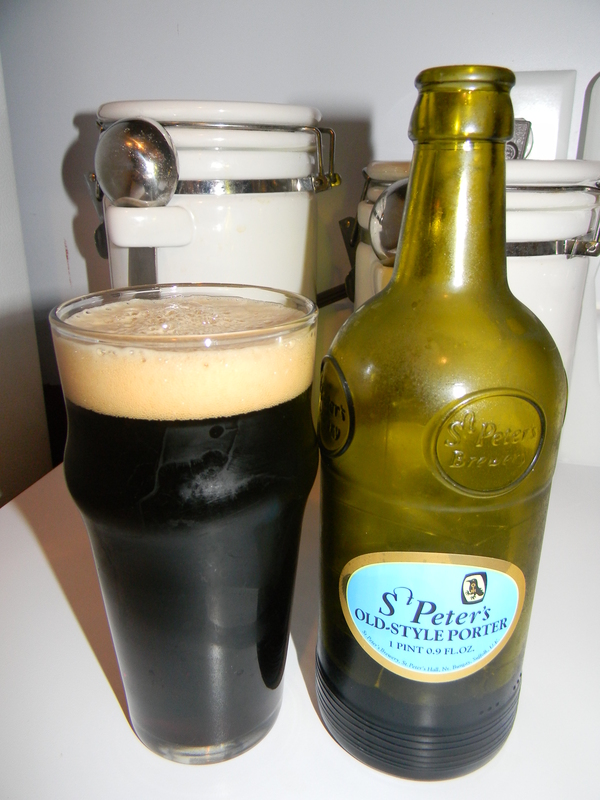 Be sure to let me know what you think of the St. Peter’s Old Style Porter if you’ve tried it. I’d be interested in hearing a second opinion.